Have questions, concerns, or just want to talk about the market? 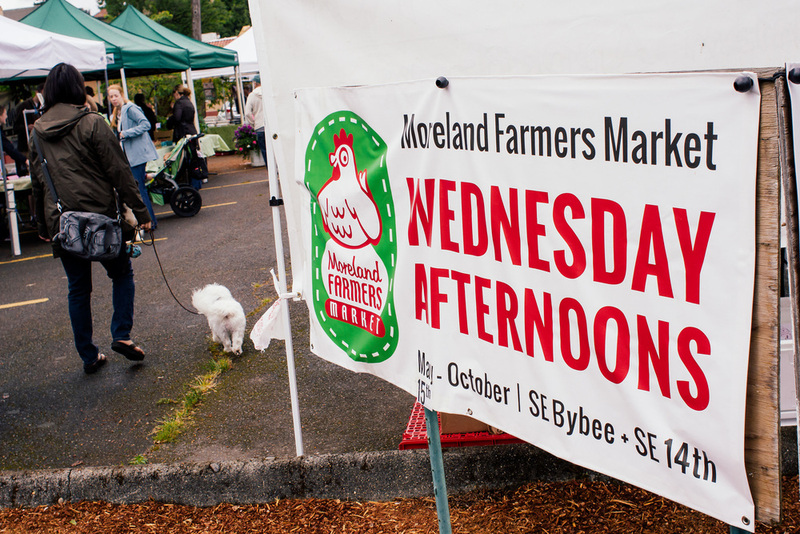 Call Lannie at (503) 341-9350, email info@morelandfarmersmarket.org, or fill out the contact form below. Thank! We'll contact you shortly. It all started in 2005. A group of neighbors wanted to create a healthy, local food scene that was accessible to more people. A generous Westmoreland businessman provided seed money. Two more business owners donated the use of their small parking lot in the heart of the West Moreland neighborhood. An all-volunteer group worked all winter long, and in May of 2006, the Moreland Farmers Market (MFM) opened. It was immediately embraced by the neighborhood. The following year, the market needed more space. Wilhelm’s of Portland stepped forward and donated the use of their parking lot on SE 14th Street. The market has been there ever since. Our mission is to create a neighborhood space where local farmers can sell their fresh produce, cheese, meat, fish, honey, baked goods, prepared food, cut flowers and plant starts (in the spring), a space that is readily accessible to all. MFM provides several programs to help more people connect with healthy, local food. MFM added an EBT machine in 2008. This allows Oregon Trail Card users (aka SNAP) to spend their benefits on fresh food at the market. Sponsored by support within the community and the Farmers Market Fund, MFM will be offering a $5 SNAP match program. For every SNAP dollar spent (up to $5), the recipient gets another dollar to spend on fresh food at the market. A donation from Bob's Red Mill, along with help from other generous donors allows us to offer $5 tokens, recipes, and dry goods to Seniors in our community. We also work with Project Linkage to provide rides for seniors and disabled customers who have no other way to get to the market. We wouldn’t have a neighborhood farmers market without volunteers. Volunteers staff the MFM Welcome Booth. They help set up and take down the market; organize events like cooking demos, music and activities for kids; and promote the market by placing ads, managing the web site, and putting up posters. To find out more about volunteering, see our Become A Volunteer page. Lannie Kali, as been a part of our market in many ways over the years. Volunteer, Intern, Vendor, and now in her second year as our Market Manager! Lannie is the mother of two and a food activist! She was a founding member of the Lents food group, which led to the Lents Farmers Market. In 2011 she was named one of Portland’s"Top 10 in the Food Movement" by National Jewish Food Movement Tuv Ha'Aretz. In addition to all the work she does for our market, Lannie also currently manages for the Cedar Mill Farmers Market and is a chef at Sur La Table. Interested in being a 2019 intern for the market? Email us!